What is it: A limited-edition waterproof liquid liner that boasts all-day staying power. 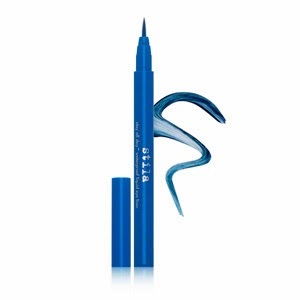 Beauty bonus: This bright blue liner is surprisingly true to its color when applied. We've all experienced those disappointingly faint, almost-sheer liquid liners, but this is definitely not one of them. It goes on bright with only one sweep. Beauty bummer: The applicator tip is extremely fine and not super flexible, which is great for precision but not so great for creating a bolder, thicker line. We also found it was a bit difficult to remove with soap and water ... but then again, it is waterproof. A makeup remover is required to fully take off the look at the end of the day. Overall: Stila Stay All Day Waterproof Liquid Eye Liner in Cobalt is a great liner that delivers bright, solid color that won't flake or fade throughout the day. Great colour! Looks like it has a nice rich pigment too! But the one thing I hate about waterproof products is how hard they are to take off...however I still love them.